The Rocky Ridge Shane Homes YMCA community centre project in northwest Calgary rests among the last of the Prairie’s rolling hills that surrounds it. 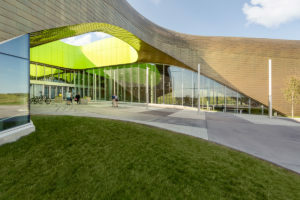 As you move around the building, its shape changes with the landscape, and the building itself, seems to offer each individual user a unique space. Efficient products were carefully selected to ensure the building’s performance remained optimal. For example, Guardian’s SuperNeutral 54 (on surface 2) was chosen as this project’s high-performance glazing while targeting LEED Gold. Guardian SuperNeutral 54 offers a lower visible light transmission which also works to reduce interior glare for occupant’s in Calgary’s luminous environment. SuperNeutral 54 is also a great choice for controlling solar heat gain and lowering the interior cooling demand. This project has already won several awards for its design and undoubtedly deserves many more accolades. Congratulations GEC architecture for delivering a unique and beautiful project within a typical budget, and congratulations to Flynn Canada for delivering a product that would help enhance this project’s overall goals. To view more project details and images visit Vitrum’s portfolio page: https://www.vitrum.ca/portfolio/ and select “ALL”.